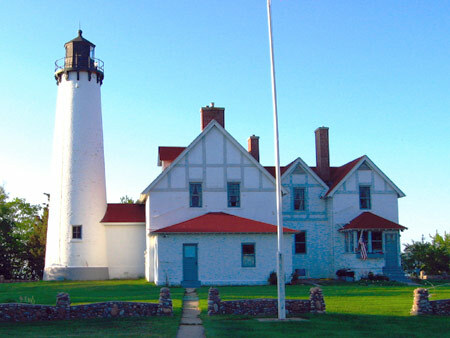 The Hiawatha National Forest maintains Point Iroquois Lighthouse as a historic structure. It is located a few miles north of Bay Mills on the lakeshore drive. The point is the site of a historic battle between the Iroquois and Chippewa Indians. As a strategic gateway to the St. Mary's River channel, the point served as a navigational aid to early voyageur-traders and later the commercial shipping industry. The lighthouse was constructed in 1870 and operated until 1963 when it was de-activated and replaced by an automatic light in the middle of the channel. Visitors can climb the stairs to the top of the lighthouse tower and view the lake and channel through a telescope. There is also a small museum exhibit and a rendition of the captains quarters and a boardwalk nature trail around the point. < < < The spiral staircase leading to the top of the lighthouse tower. The tiny blip out on the lake is the automatic light that replaced the one in the light tower. A portion of the lakeside nature trail is also seen. A few rooms are set up as museum exhibits furnished as they were when the light keeper and his family lived there. Marquette, Munising and Pictured Rocks National Park . 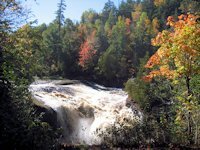 . . More waterfalls and hiking pages from the Keweenaw Peninsula through Tahquemenon Falls to Sault Ste. Marie. Upper Michigan Travel Directory . 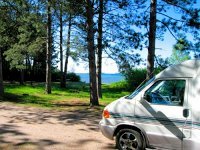 . . Our directory to scenic travel along the Lake Superior Circle Route in Michigan's Upper Peninsula - Ironwood to Sault Ste. Marie. 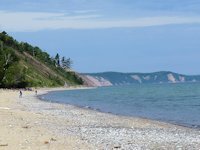 Best Rock Picking and Agate Hunting Beaches in the Upper Peninsula. 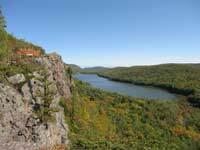 Scenic Byway - Fall Color.